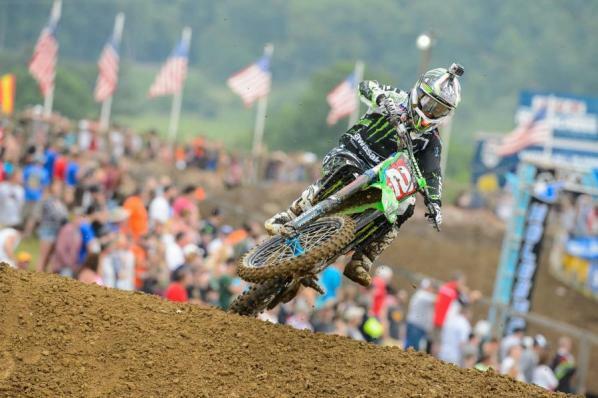 In the 450 Class, Monster Energy Kawasaki’s Ryan Villopoto bounced back from losing his first overall of the season last weekend at the Built Ford Tough Tennessee National. Any momentum gained by the competition has been put to rest after another 1-1 RV performance—his third overall on the season—punctuated by a second moto that saw him pass his toughest competitors to grab the win. In the 250 Class Marvin Musquin held off a valiant charge from his Red Bull KTM teammate Ken Roczen in the second moto to secure his first career moto win and second consecutive overall. Villopoto, whose had to come from behind in many motos this season, ripped his second holeshot on the young season in the first 450 moto. Honda Muscle Milk’s Justin Barcia and Monster Energy/Pro Circuit Kawasaki’s Tyla Rattray were in tow, while Red Bull KTM’s Ryan Dungey was just outside a top five position. 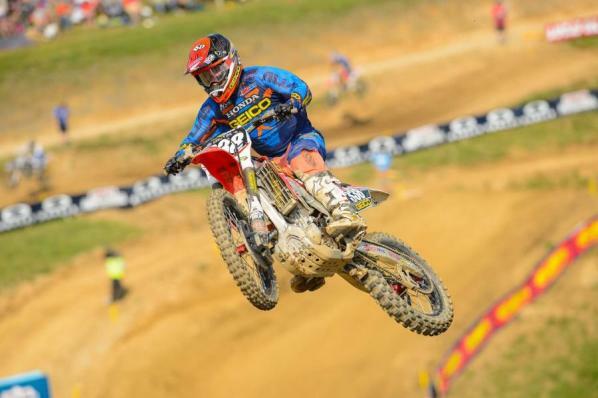 RV was in complete control of the 450 Class at High Point. Dungey took second behind RV in both motos. Stewart took a rock to the eye in the first moto. Barcia knifed underneath RV but then bobbled, and RV quickly pulled the trigger and blasted to a huge early lead, leaving Barcia to fend off Rattray and the hard charging Dungey for second. The tough start gave Dungey little room for error as he was forced to work his way around Rattray and Barcia if he wanted to capture second. Dungey went to work on Rattray, making a pass stick on lap three and set his sights on the young rookie. It took Dungey all of three laps to catch and make something stick on Barcia. Although he was setting times similar to Villopoto late in the moto, the damage was done off the start and he had no shot at catching the points leader. Barcia capped the moto podium, and Rattray had his best result of the season in fourth. Josh Grant was a season-best fifth, with Ryan Sipes, Trey Canard, Jake Weimer, Phil Nicoletti and Mike Alessi rounding out the top ten. While he yarded the field in the first moto, the second moto was not going to be a walk in the park for Villopoto. After JGR/Toyota Yamaha’s Josh Grant snagged the Motorcyle-Superstore.com holeshot, Dungey grabbed the lead a few turns into it. Right after that, Yoshimura Suzuki’s James Stewart made a mad dash to uproot Grant and Dungey. Stewart, whose second moto status was in doubt after taking a rock to the eye in the first moto (he accidentally pulled all of his tearoffs, then had to ditch his goggles, leading to the eye injury) suddenly found his old form, grabbing the lead and getting away. Dungey and Villopoto were lurking after Stewart, setting up a three-way battle for the moto win. Wasting little time, Villopoto went after Dungey hard, making a calculated pass on defending champion by slamming on the binders and cutting an inside line in the corner following the infield triple. The hard move put Villopoto on the fender of Stewart, but Dungey was far from done as he locked onto the current points leader. The battle we had been waiting for the entire season was in the works for all of five laps, when suddenly Villopoto pulled alongside Stewart, and Stewart promptly hung a right into the mechanic’s area. The Suzuki rider had broken his front brake rotor, and his front wheel locked up—Stewart went from leading to out of the race. 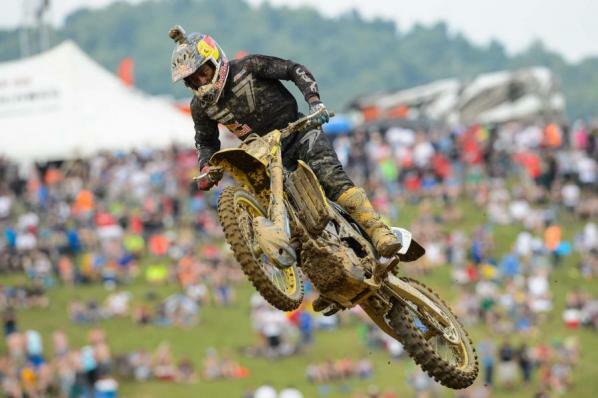 Knowing he needed the win for the overall, Dungey began to push RV, hoping to force a mistake. The big mistake Dungey needed never came from RV, as he rode a flawless race to score the overall on the day. Dungey would take second in the moto, followed by Mike Alessi, Tyla Rattray, Trey Canard, Justin Barcia, Josh Grant (who crashed after leading early), Jake Weimer and Justin Brayton. 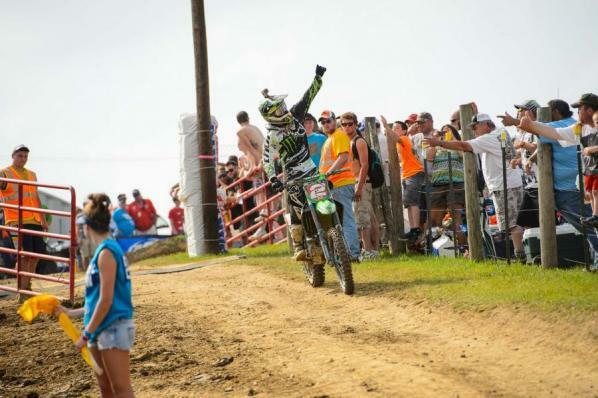 Villopoto (1-1) captured his third overall in four rounds with Dungey (2-2) coming in second. Tyla Rattray’s 4-4 scores were good enough for his first overall podium of his 450 Class career. Stewart led early in the second moto. 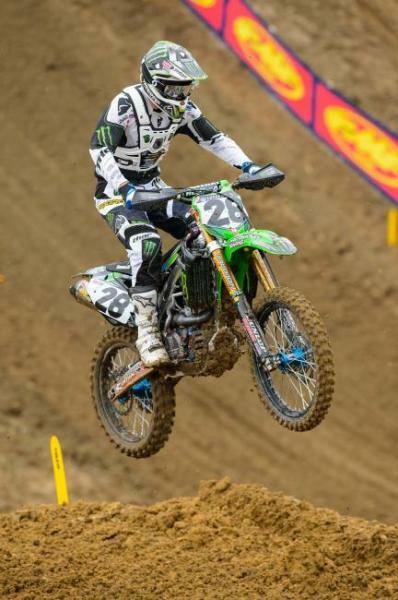 Rattray had his best finish of the season at High Point. RV holds a commanding lead after his third overall. In the 250s, GEICO Honda’s Zach Osborne grabbed the Motorcycle-Superstore.com moto 1 holeshot. Yet it was Ken Roczen, who’s made a habit of breaking away in the first motos (winning three straight first motos heading into High Point), who quickly took over the lead. Roczen somehow passed about eight riders in the course of five turns, then clicked off thirty plus two of perfection—winning his fourth straight moto 1 win of the season. Monotony rued the day up front, while chaos took hold behind. Marvin Musquin, Osborne, Justin Bogle, local hero Darryn Durham, Cole Seely, Jason Anderson, Eli Tomac and a host of other engaged in a full on donnybrook through the first half. Seely held second over Marvin Musquin but lost the frontend and crashed after Bradshaw Boulevard. Seely would remount to stay within the top ten, but had another big crash late in the race. He would stay on the ground for quite some time before getting up. Seely would make it out for the second moto after a visit to the Asterisk Medical Mobile Unit. Meanwhile, Osborne and Anderson were having troubles of their own. Osborne, struggling with arm pump, was sliding back through the field when he took Anderson down right before the Incredible Huck double jump. Anderson would come back to finish 12th. Blake Baggett rebounded from a horrible start to climb inside the top five, before tipping over in the corner following the uphill triple, collecting Durham and Osborne with him. All three would remount and finish the race. After another so-so start, Tomac made a late charge at Musquin, closing the gap to within seconds late in the race. The GEICO Honda rider was putting in lap times in the 2:08 and 2:09 range with just a few laps remaining. 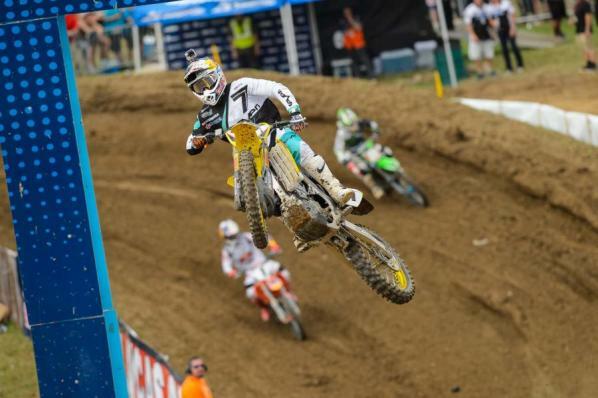 But Musquin responded to the challenge, holding strong to take second. Tomac, Baggett, Bogle, Cooper Webb, Kyle Cunningham, Darryn Durham, Jeremy Martin and Zach Osborne would round out the top ten. The European Union made their stand in the second 250 moto from High Point. Musquin grabbed the Motorcycle-Superstore.com Holeshot, but soon Osborne and Roczen were up to second and third, with rookies Jeremy Martin and Joey Savatgy also in the mix. Zach Osborne lead early in moto two. 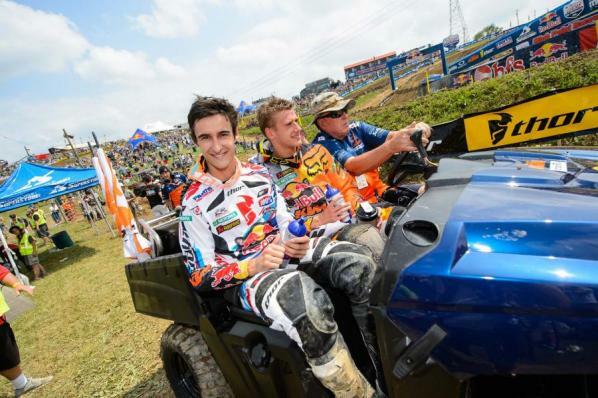 Musquin won his second straight overall. The European duo quickly dashed to the front as Musquin opened a lead and Roczen made a move on Osborne to take second—meaning the battle for the overall would come down to the Red Bull KTM teammates. Roczen rode the back fender of Musquin all moto, trying multiple lines to rattle the Frenchman. Roczen pushed Musquin to the limit but was never able to make a pass stick. 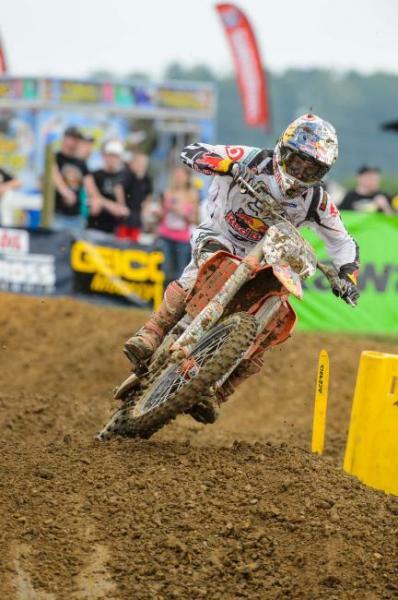 Musquin held on for his first career moto win and second consecutive overall. Starts have been a hindrance for Eli Tomac all season, with High Point proving to be no expectation. Another bad start in the second moto left Tomac just outside the top ten. He worked his way forward, then had a crash, but was able to make late passes on Martin and Savatgy to secure fourth, but lost valuable points to Roczen and Musquin. Savatgy held off Martin for fifth, with Anderson, Blake Baggett and Justin Bogle following. Musquin claimed the overall via 2-1 scores with Roczen (1-2) and Tomac (3-4) rounding out the podium. The Women’s Motocross Class was back in action for their second of three rounds, and this time veteran six-time champion Jessica Patterson bounced back with a 1-1 overall win on her N-Fab TiLUBE Yamaha. In moto won, Patterson had to work on Rock River Yamaha’s Mackenzie Tricker, who led most of the way while also battling a knee injury. Patterson finally wore her down and made a late-race pass to steal the lead and the victory. In moto two, Patterson simply took off from the start and scored a dominant win. But the points in the short WMX Triple Crown Series are all mixed up, since Patterson scored a DNF in a moto at the Hangtown opener, and the Hangtown winner, Courtney Duncan, missed High Point with a broken wrist. This all leaves Honda Muscle Milk’s Sayaka Kaneshiro with the points lead heading into the last round at Southwick at the end of the month. For full moto and race results click HERE. Click HERE for full standings.